DEZHOU, China — The savory aromas of roasting hot dogs and chicken kebabs wafted out of metal and glass vacuum tubes heated by mirrors curved to capture the sun's heat. 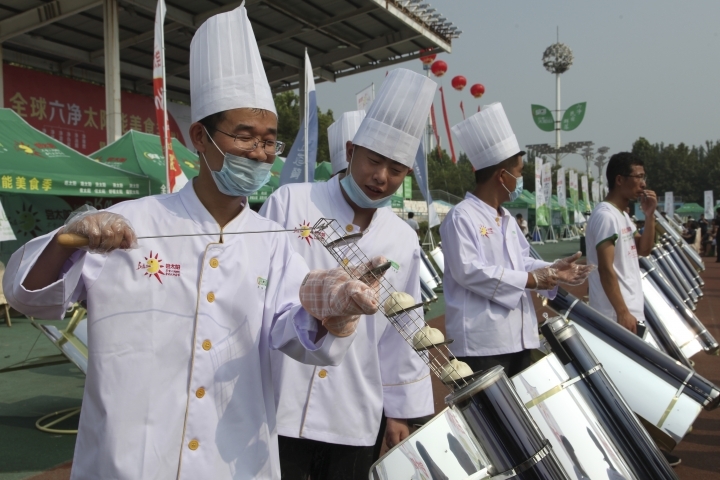 Two dozen chefs with white aprons and hats prepared soups, baked "baozi" pork buns, and boiled rice porridge at a festival designed to demonstrate the potential of solar cookers that organizers claim can help reduce climate-changing greenhouse gas emissions. 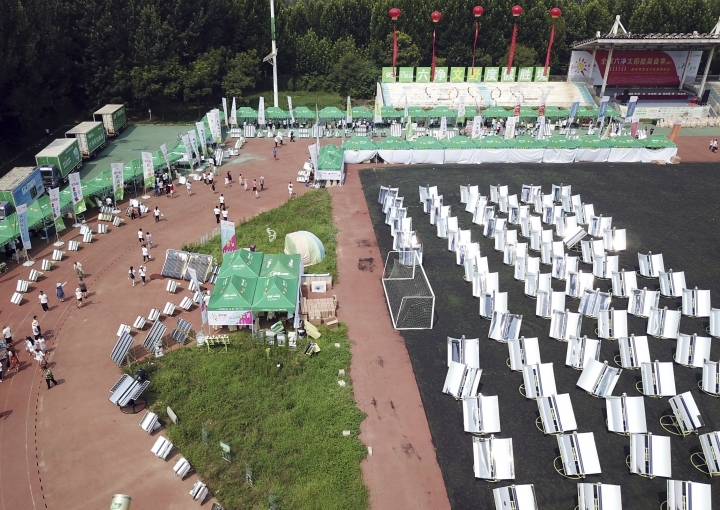 "We aim to enable half of the world's population to use solar cooking within 10 years," said Huang Ming, founder of Himin Solar Energy Group, the solar cookout's main backer. Temperatures can top 400 C (750 F) inside the black "BBQ tubes" of metal and glass with turnip-tipped bottoms and sealable tops. On a bright day, they can boil water within 30 minutes and roast a fish in half that time, according to Himin. "It is clean and smoke-free . 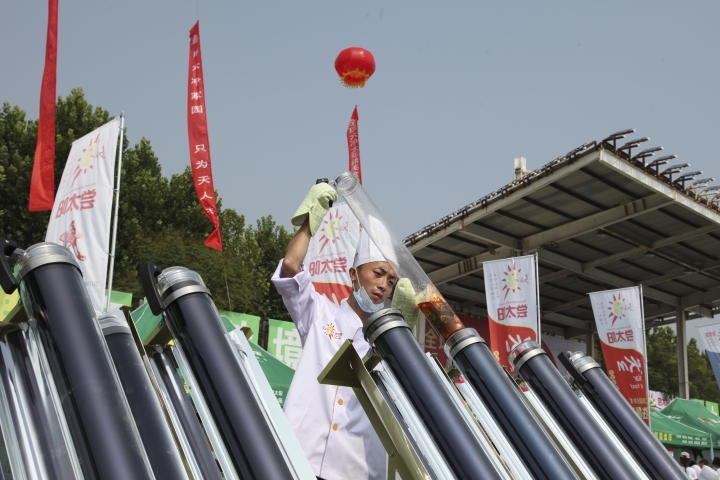 better than cooking with pots and other things," said Yu Liqiu, 22, a chef, who just began cooking with solar two days earlier. 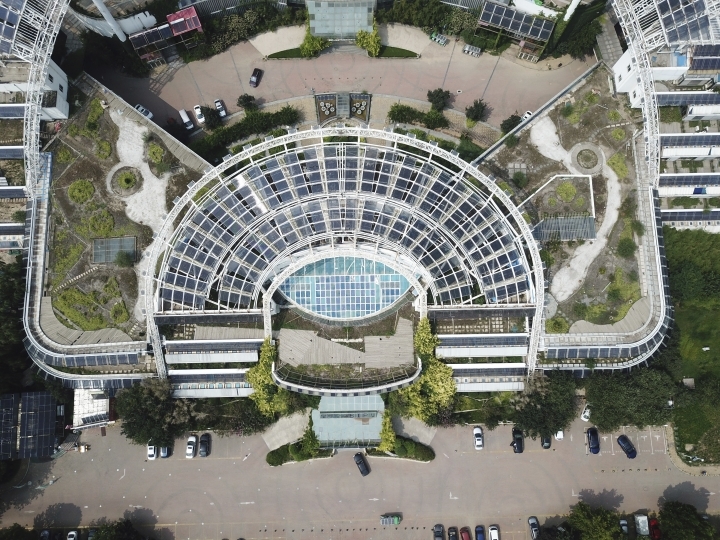 Dezhou, a sprawling city of 5 million in eastern China, has spent millions since 2005 on transforming itself into an aspiring renewable energy hub called the "Solar Valley." 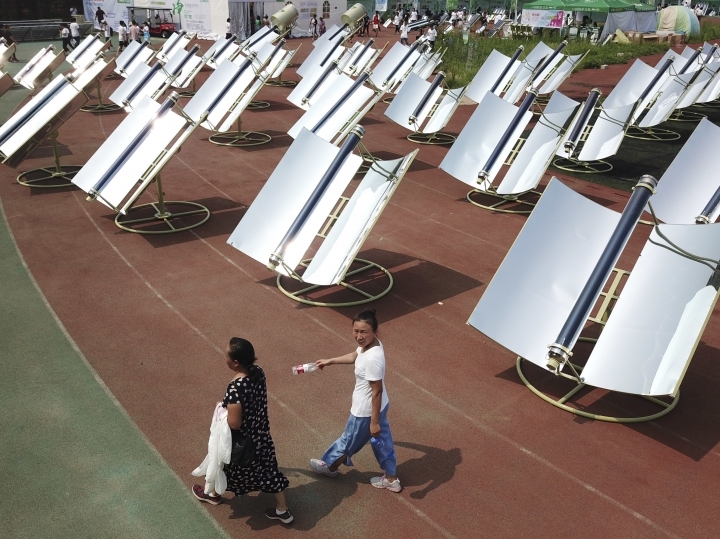 China is the world's biggest consumer and producer of solar technologies. Many homes outside the largest cities are equipped with solar water heaters. But roughly 600 million of China's 1.4 billion people still cook with coal, wood or other biomass despite decades of government-led initiatives to curtail soot from such burning, according to a 2016 report by the Global Alliance for Clean Cookstoves. "There's a certainly a need for a cleaner option," he said. Eastern China is a "global hotspot" for black carbon emissions __ sooty particulates more damaging to health and the environment than typical greenhouses gases __ according to a 2007 report in the academic journal Nature. 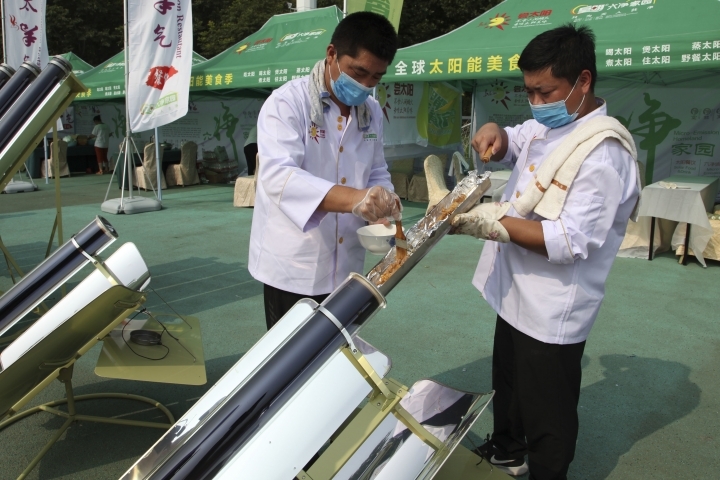 Half of China's black carbon comes from residential kitchens and heaters. Sun Penglong, 27, worked in gas kitchens in Dezhou for years before switching to solar. He says new recipes must be invented and tested for solar cooking, but there is one unexpected perk: His wife doesn't complain about the smell he used to bring home in his workclothes. "The first thing my wife used to ask me to do after returning home was to shower," Sun said after roasting some beef skewers in a BBQ tube. "When I started as a solar chef, my wife asked me, 'Where is your smell?'" 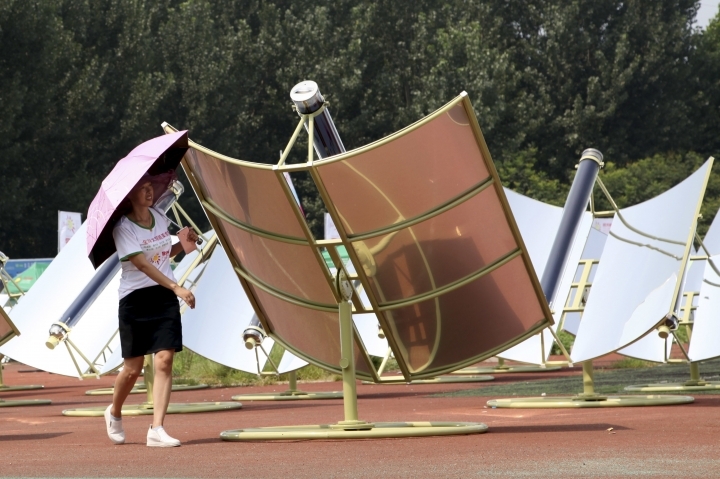 Solar cooker technology has not yet matured. While cheap types are available, more reliable ones are still too expensive for rural communities. "It's kind of a chicken and egg thing," Haugwitz said. "It is good to have some innovation, but it's impossible to change people's dietary habits," said Xu Qinhua, deputy director of National Academy of Development and Strategy under Renmin University of China. "People used to say China's fire-fried dish culture would be replaced by induction cookers, but no, it was not." 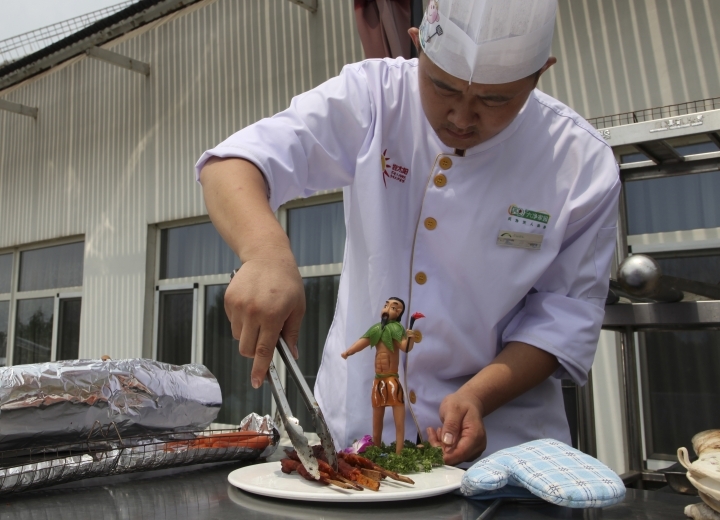 Next came a marathon banquet of courses, including turtle soup and pancakes served on platters with foot-tall figurines of Chinese legends like the mythical archer Houyi. According to legend, he shot dead nine suns before harnessing fire for humanity's benefit. "I was impressed by the taste of pig feet cooked by solar, it was soft and yummy, I could not believe it was cooked by solar," she said.